Making fortune cookies has been on my list for years. 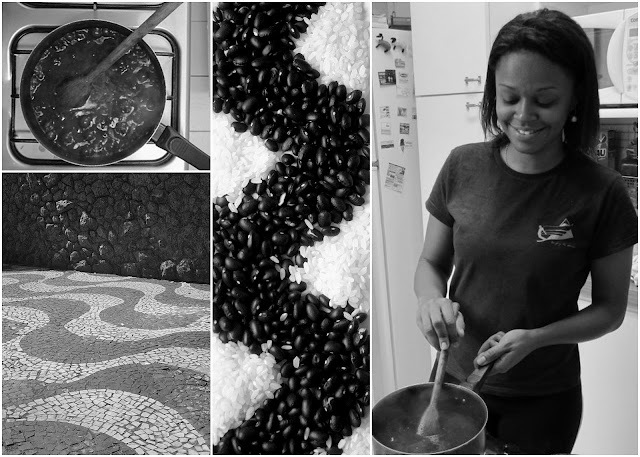 Every time I started to poke around recipes online, I balked because of the reviews. For every person who said such-and-such recipe was easy and perfect, there was another who said it was an utter disaster. I wanted better odds of success before wading into that territory. 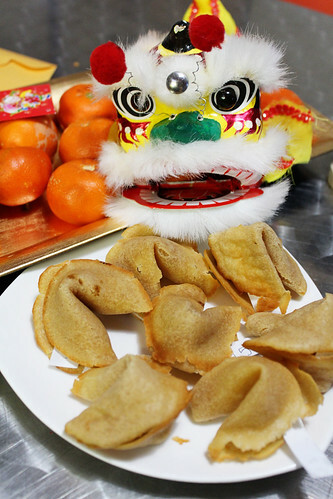 But this year, I forgot to get a new bag of fortune cookies on our annual Lunar New Year shopping trip to Chinatown. 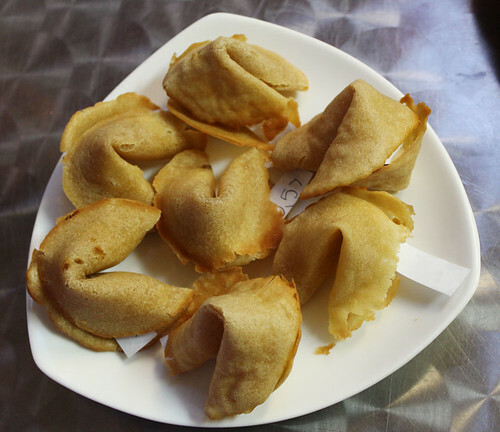 We usually swing by Golden Gate Fortune Cookie Co. to see the treats being made and bring a bag home. This year we filled up on dim sum, boba tea, and egg tarts, but rushed home without our cookies. This was it: The Year of the Horse would be the year I tried fortune cookies. And they were a success! They tasted delicious and the kids loved them. And they weren't too difficult. We'll happily make them again soon. Probably within a few days. One of these is not like the others... the one on the left is smoother and has more defined edges because we used parchment paper to help shape it. Anna solved the trickiest challenge: getting each cookie thin and flat. These cookies need to be ridiculously thin — almost translucent. Most recipes say to use a spatula or spoon to spread the dough in a circle on a greased sheet or silicon mat. We did that for most of ours, and they came out OK but were uneven, a little bumpy, and with crumbly edges. Our trick: Anna spread them on floured parchment paper, then used another sheet of floured parchment paper to press them flat. We popped them in the oven, covered in parchment paper, and they came out beautifully. (That's a little pastry technique she picked up in Paris. Never miss a chance to give credit to things from Paris.) You can see the difference in the photo above: The cookie at the bottom left is from the parchment paper batch. Perfect! There will be losses. It takes some practice to get the hang of it, and even then there will be casualties. 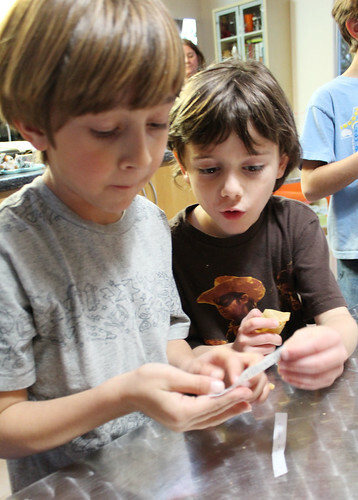 Making fortune cookies is time-consuming. Relax and make an afternoon of it. Crispiness is a high goal. A few of ours crisped evenly and nicely, but most had slightly chewy centers. Practice will help, and some advise returning the shaped cookies to a 250 degree oven for a few minutes to crisp. We ate all ours, and so didn't try it. Hey, look! Another fortune about Minecraft! This recipe makes 18-20 cookies. Adapted from Allrecipes and Fifteen Spatulas. Preheat the oven to 375 degrees. Line a baking sheet with parchment paper (trace 3" circles onto the paper as a guide, if you wish) and dust lightly with flour. Lightly dust a second sheet of parchment paper with flour and set aside. In a medium bowl, whisk the egg whites and sugar until they're frothy. Whisk in the melted butter, extracts, and water, then mix in the flour just until it's blended in — don't over-mix. The mixture should be like a light pancake batter, not a doughy cookie batter. Scoop a generous 1/2 tablespoon of batter onto the prepared baking sheet. Use the measuring spoon to spread it into a very thin circle, about 3 inches across. Do no more than 3 or 4 cookies at a time (and for your first try, I recommend doing only two). 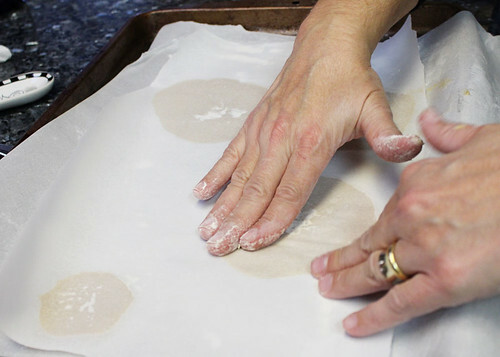 Lay the second piece of parchment over the batter, floured side down, and press down to ensure evenly flat, thin cookies. Leave the paper in place. Bake cookies on the middle rack of the oven for 6 to 7 minutes. They're done when they're just golden around the edges. They need to be soft and pliable for folding.